Next week, the Freeride World Tour (FWT19) will stage its final stop of the season on the legendary Bec des Rosses face in Verbier, Switzerland. Nordica athlete Stefan Häusl spent nine years as a FWT athlete, and judged his first FWT event in Fieberbrunn, Austria earlier this year. We caught a lift with Häusl on his home mountain in St. Anton, Austria, and quizzed him about what the judges are looking for—and what spectators should watch for—next week in Verbier. SKImag.com: What did you look for as a first-time FWT judge at Fieberbrunn last month? Stefan Häusl: We have the five criteria we’re looking at, but the top one is Overall Impression... there needs to be something exciting in every run. And then we have the criteria that this run needs to be safe and solid, [with] good technique and style. But overall, [I look for a run with] emotion that kills you when you watch the run, and Markus Eder did a great job [demonstrating that in Fieberbrunn] and he won. What will the judges be looking for at Xtreme Verbier FWT19? The judging system evolved over the last [few] years on the FWT, and I think the judging is very good nowadays. Of course, some judges look more for the same thing [as me], but that’s good because you get a variety in the points. Did you win at Verbier when you were an athlete? 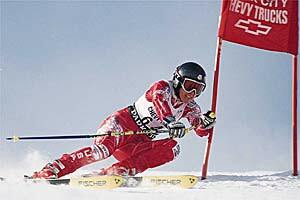 I once led the [FWT overall points] before Verbier, and I needed to win the comp, and then I crashed. My best result was 4th at Verbier. What should people watching the live stream look for on the Bec des Rosses? What you don’t see on the live stream all the time is how exposed the area is where the skiers and snowboarders are. If you watch it for real, you see the scary part on the [looker&apos;s] right side and the somewhat easier part on the left side. But in the live stream, you don’t realize where the person is on the mountain. Therefore, it’s important and fun to look at the mountain beforehand so you see the key lines. It’s more interesting to watch it when you know where the rider is. How is the FWT evolving? Of course, it’s clear to see that jumping cliffs is one thing, but doing tricks is the next level. You see more and more tricks on the FWT. But on the Verbier Xtreme, it’s very difficult to do tricks. Last year we saw some, but most of them were on the looker’s left side, and on the right side it’s still very alpine and exposed, so we will not see that many tricks there. I think solid, full-on big mountain style can also win on the Bec des Rosses. But with the evolution of the sport, of course, we will see more tricks. The final stop of FWT19 is scheduled to take place in Verbier, Switzerland between March 23-31, 2019. Keep your eyes on the FWT website for more info about the event, and keep up-to-date with all of the FWT19 action on SKImag.com&apos;s FWT page, as well as SKI Magazine&apos;s Facebook and Twitter channels.The event will live stream on FWT&apos;s YouTube channel. Editor&apos;s note: This interview has been lightly edited for grammar.